One of three juvenile hawks recently born on the roof of Mount Sinai Hospital. The young birds are facing the challenge of learning to fly over busy University Avenue. July 7, 2017 (Toronto, ON) – High-risk births are a specialty at Mount Sinai Hospital – but they usually happen inside the hospital, not on a building ledge overlooking busy University Avenue. 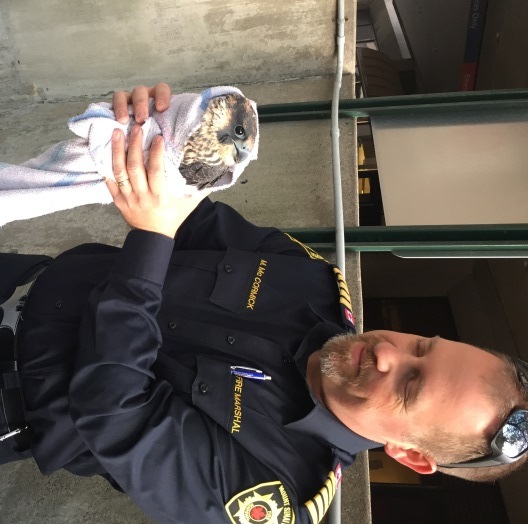 Mark McCormick, Fire Marshal at Mount Sinai Hospital helped rescue one of the falcons that needed some help during flying lessons. natural mortality rate of 80% so each one rescued is important to the recovery of the species. One baby falcon was rescued this week by Mount Sinai’s head of security when it lost its footing while learning to fly and landed near the entrance of the hospital. “Mount Sinai Hospital is the logical destination for this birth – two-thirds of the pregnancies we care for are considered high-risk after all, and patients do indeed come from all over the country to access our services,” said Dr. Mathew Sermer, Obstetrician and Gynaecologist-in-Chief at Mount Sinai Hospital, part of Sinai Health System. The species, which was once endangered, has made a significant recovery in recent years. While they typically nest on cliff edges, urban Peregrine Falcons often use ledges on high-rise buildings. While the Peregrines have been nesting at Mount Sinai Hospital for many years, this year is the first in approximately eight years that resulted in a successful birth. Mount Sinai Hospital, part of Sinai Health System, is as an internationally recognized 442-bed acute care academic health sciences centre affiliated with the University of Toronto. Clinical strengths include women’s and infants’ health, chronic disease management, specialized cancer care, emergency medicine, and geriatrics. Mount Sinai has been designated with Exemplary Status from Accreditation Canada and every aspect of patient care is anchored in a rigorous quality plan and monitoring of safety and quality goals. Mount Sinai is the first hospital in Canada to receive Magnet® status for nursing excellence and patient care. The Hospital is considered to be a top employer in Canada, receiving multiple awards for its employment and culture centred programs. www.mountsinai.ca.